Simple and effective plugin designed to protect area from destruction. The main difference from other similar plugins is the lack of saving information about protected area in databases or in file; certain modularity, which allows combine protected areas in any forms, so you can easy protect even a winding road; maintaining the possibility of destroying blocks under the protected territory and building over it. Just place the "protector" block (default - bedrock) and you will create a create a "force field" of certain size (radius, depth, height are configurable) around that block. When you place other block, you increasing protected are. For convenience provided special wand-mode in which you can easily bury the protector (under 1 block) by right clicking with the wand (default - clay) on the surface of area, that you need to protect. If necessary to build something in protected zone, you can use the edit mode provided by plugin, or switch to creative mode. 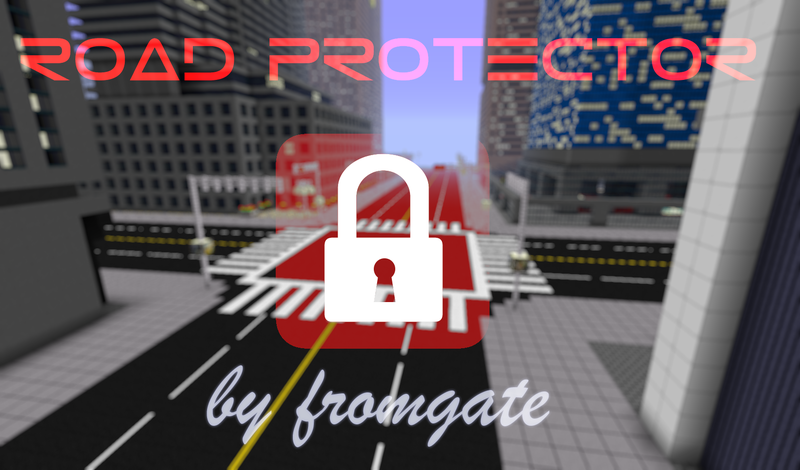 If you created a road and protect it using RoadProtector you can enable fast-sprinting at the roads. Command /rp speedway will toggle the speedway mode. First you must define road pavement blocks: it's a top block of your roads. For example if you using gravel and slabs to build roads you must define blocks 13,43,44 as a "speed blocks" (use command /rp speedblock 13,43,44). Than you need to define sprinting speed at your roads: /rp speed <speed>. Default speed value is set to 0 and it equal to effect of speed-potion level 1. Player with permission roadprotector.speedway now can sprint very fast on the road. Walking speed will not modified, player will walk with normal speed. Since the plugin is designed for server administration, then you can use the creative-mode or any editor for example Voxels Sniper and remove the block tread. In addition, if you define as a "protector" any other block, for example a sponge, this block can be destroyed in the edit mode in the usual way. /rp edit — enable / disable the edit mode. /rp wand — enable / disable the "protector wand"
/rp walk — enable / disable the "walk mode"
/rp w [radius] — set the "radius", which determines the horizontal dimensions of the protective zone. /rp swlist — set the "switch" blocks to protect (doors, buttons, levers, chests, etc...). Default list: 54,61,62,64,69,77,96,84,107,23. If list is empty only build/break protection will be active. /rp prtmsg <message text> — set warning message when building and breaking blocks. If empty, will use default message. /rp swmsg <message text> — set warning message when try to click blocks from /rp swlist. If empty, message will not displayed. I would like to report that road protection is working correctly in 1.7.2, without generating any errors in the console. Ok, plugin is crashing us now. Wow this plugin is just what I needed! Speed roads is the best thanks so much please keep it up your doing great! I would recommend patching up the bug where people sprinting on the paths kind of glitch up between speed potion and no speed potion here and there. Its nothing much though a few stutters can't be too bad. swlist is for "switchable" blocks only: buttons, lever, chests, doors... everything that could be activated by rightclick. Could you also add an anti-fire capability to this plugin, in addition to the anti-lava/water/snow feature? You disable and enable protection from explosions. With enabled explosion protection it will protect area from explosions. Also, I was wondering if it would be possible to have more than one type of protector block. That way I could have one that would protect just roads, and one that would protect things that are elevated above the ground, like train tracks. Since some of the train tracks will be elevated above the ground, I would like some way to protect the supports as well, but the regular roads don't need that deep of a protection area. I noticed on your recent files that the latest build is for 1.4.2. Do you know if it will work with 1.4.7? I'm not sure that you understand what is RoadProtector and how it works. In addition in area protected by road protector players cannot use items defined by id-list (command /rp swlist). This option is actual for doors, levers, chests, buttons... If you clear this list (set it empty) you RoadProtector must provide only protection against build or breaking. Speedways are roads created from blocks defined in list /rp speedblock <id1,id2,...id3> and protected by RoadProtector. For example you need to use gravel in speedways. You must define it list: /rp speedblock 13 and protect this with RoadProtector. There's some way to protect areas using RoadProtector: wand mode (/rp wand) - you must right-click at protected area with wand (default - clay). It will create a protector block under the clicked block and area around clicked block will be protected. Other way is - walk mode (/rp walk). When you enable this mode and walk around it will automatically create a protector blocks under your legs, while you walking. Walk mode is very useful when you protecting long, winding road: you just walking and road is protected. So. If you going to allow player to run at gravels you must build roads with gravel, protect roads, grant "roadprotector.speedway" permission to players and define gravel in speedblock list. After this players will have additional speed while running on roads constructed with gravels and protected by RoadProtector. If road is protected but created using other blocks (cobblestone for example) players will not gain additional speed here. If gravel is not protected by RoadProtector players will not gain additional speed here. I love this plugin, but it messes too much with the rest of my server. I just want people to be able to run on gravel wherever they are. Yet i hear people say i cant run here, or i cant open my chests suddenly anymore. This plugin is being annoying, while i turned on walk mode, i can run where i am, others say hey cant run on gravel. When i tp to them i need to redo /rp walk, then everyone can do it again, then somewhere else they cant again, Why is this, its really annoying.